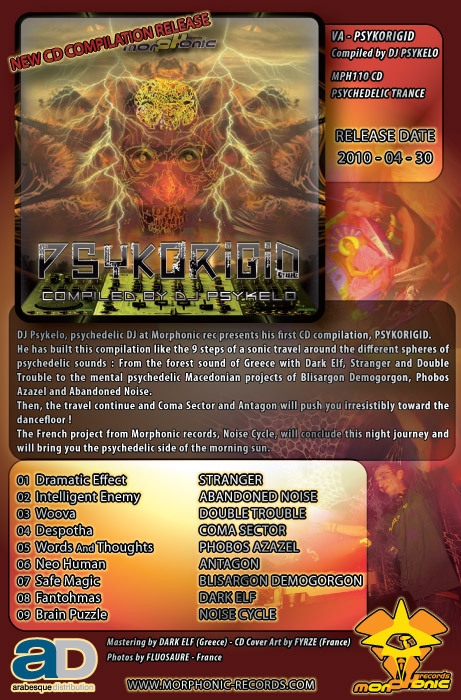 DJ Psykelo, psychedelic DJ at Morphonic rec from 2007 presents his first CD compilation, Psykorigid. from the forest sound of Greece with Dark Elf, Stranger and Double Trouble to the mental psychedelic Macedonian projects of Blisargon Demogorgon, Phobos Azazel and Abandoned Noise. Then, the travel continue and Coma Sector and Antagon will push you irresistibly toward the dancefloor ! The French project from Morphonic records, Noise Cycle, will conclude this night journey and will bring you the psychedelic side of the morning sun.